1970's Sears suburban. Going for something that still resembles a tractor at the end, but with a baja 1000 buggy theme. Should be able to build something with all those parts. Same thing i said. My garage was a mess because all my stuff was stashed away lol. I really like this build! haha, I wish I had all the parts that you have! oh, well, good luck. Thanks. It's just a bunch of used junk that no one else wanted. You know, the stuff I always use! I think the exhaust pipe is from a mini van, I can't remember. I like to save the resonators off of cars if they aren't too rusty. Pretty much like a glass pack except no packing. I also try to save tubing if it has a nice bend in it since I don't have a tubing bender. Notice I wrote "save" on that brake rotor so it doesn't get thrown into the scrap pile...again. 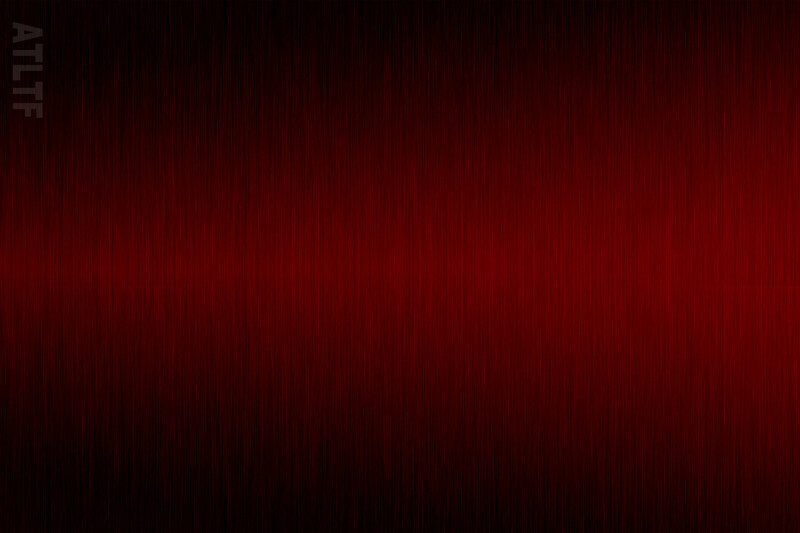 Thanks for the comments. Finally got the right rear hub free and off the axle (Last thing I was working on before the build off). Looks like the rear brake rotor I have would fit about where I wanted it too. 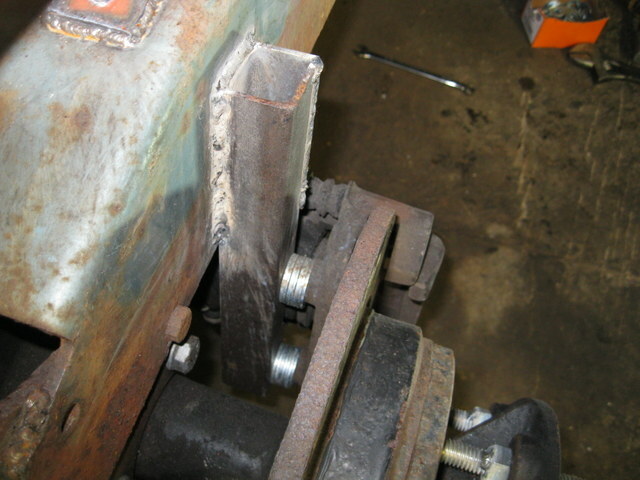 The problem is the caliper I have won't fit in close enough with the frame in the way. It's too long with the E-brake mechanism in the way. 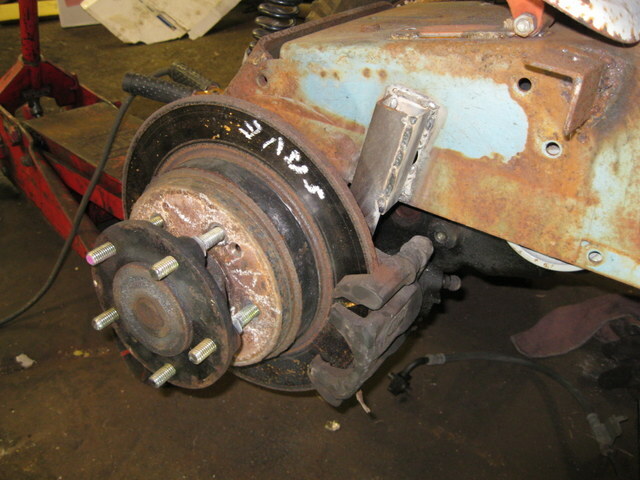 These brakes might be overkill, but I wanted to have this whole project just about indestructible. Also, they'll never need to be adjusted or wear out. Under here, the caliper would just fit with the transmission in the way, but it's too exposed. I'm sure to smash it into a million pieces on the first rock I drive over. Not only that, But it would be nice to have it where it's easy to get to. Here's about where I imagined it going when I was unbolting it off a junk lincoln. If from where my thumb is to the left was gone, It might be short enough to make it between the frame and the tire. In theory, I could cut the frame out of the way to make it fit, but that would make it kind of a hack job. Looks like I need a different caliper. Next thing to do is finish up the clutch. I have it mostly figured out, just need to weld it up. I have just about everything tacked together for my new clutch setup. 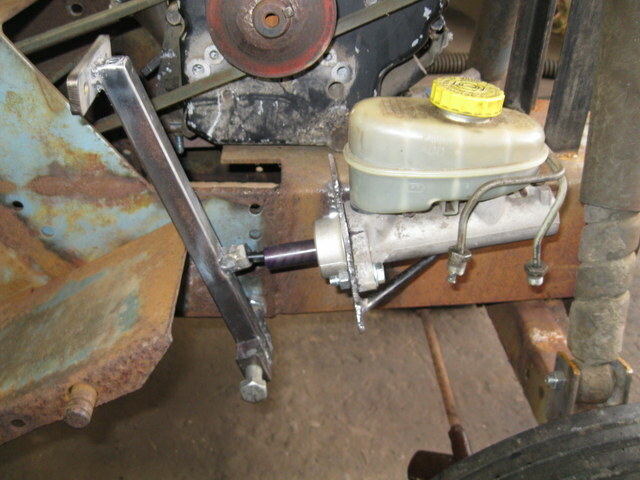 I used the clutch from a junk simplicity and the linkage rod is the original sears rod shortened by about 6" or so. I'll probably brace up the simplicity clutch a little and add a grease fitting. 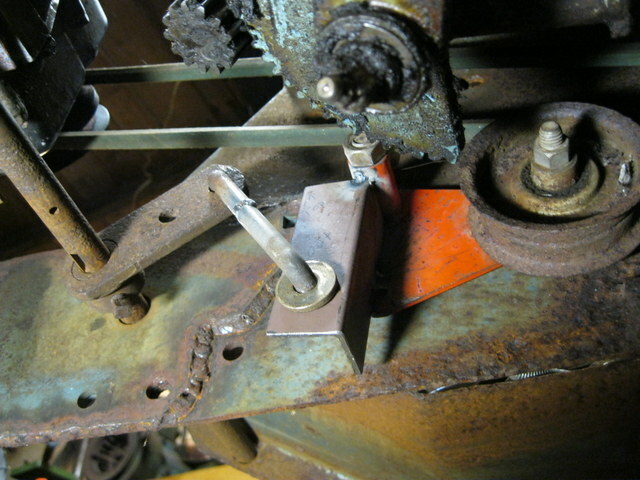 The clutch spring will hook on the bottom of the angle iron piece I added. 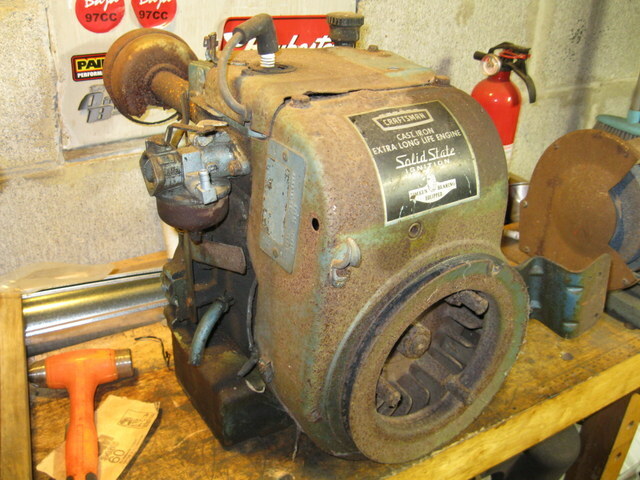 The original cast iron 12hp engine that was on the sears. I had it running about a year ago, nothing wrong with it as far as I know except how heavy it is. 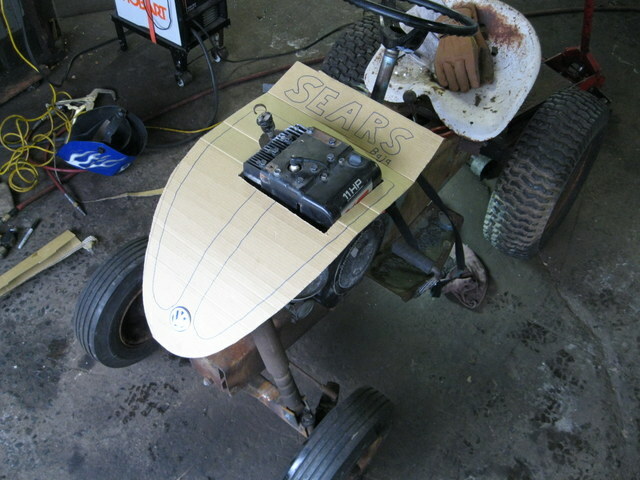 Fairly early mower engine to have electronic ignition. Sometime when I get the 11hp aluminum briggs back off, I'll weigh them to see what the difference is. I more or less finished the seat bracket. The corners of the angle iron piece on the back need to be rounded off a little for looks and I need a couple of carriage bolts for the seat so I don't have to sit on the bolt heads sticking up. I also finished welding up the clutch, added a grease fitting, and primed it. Once I get the clutch on, I'll get a belt and give it a test run. Here's another idea that I was thinking about but probably won't use. I think they're a little too big to look good, not to mention the weight issue (they would be mounted on spare rims). Also I wouldn't have any room for the gas tank back there should I decide that's where it's going. I didn't get as much done on this project as I thought I was going to over the weekend. However, I did get all the clutch parts painted up. 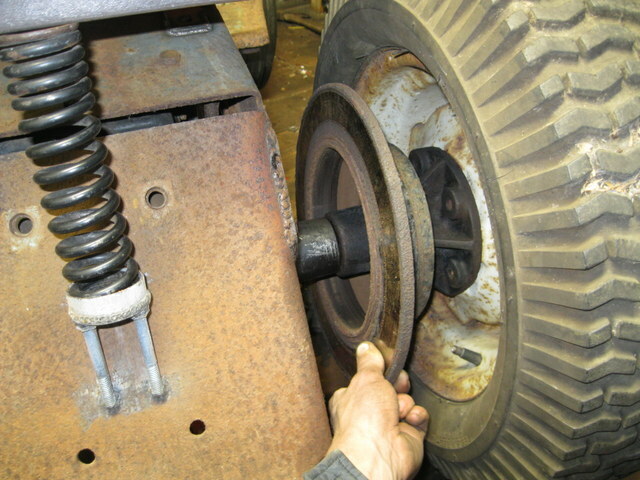 Welded on a washer where the linkage rod pulls the clutch to give it a wider surface to wear on since the angle iron is too thin. 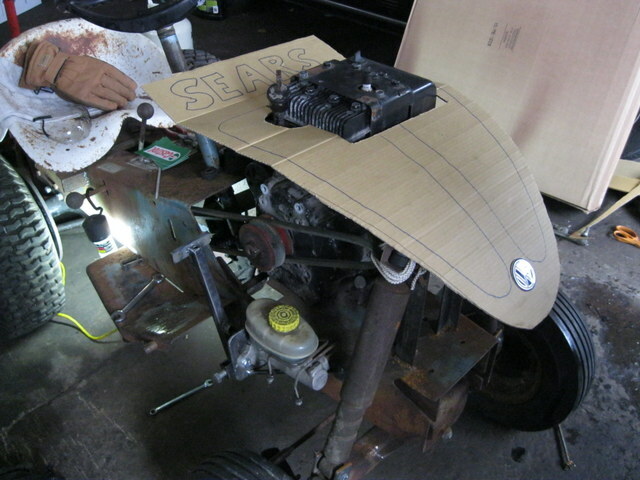 Sears did the same thing from the factory on their clutch. I thought the pulley was the original clutch pulley from this tractor, but I guess it isn't. It must have been an adjustable idler or something. I know it was off of this tractor somewhere. I have a couple ideas about how to get my brakes going, hopefully I'll be getting the whole brake system done by this coming sunday night...(Yeah right). 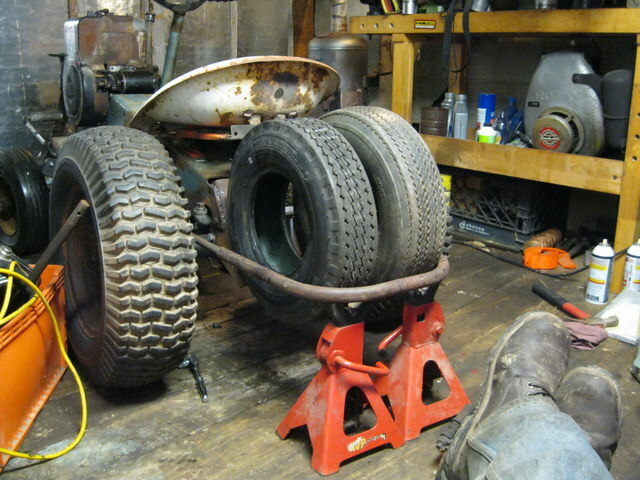 Yea i just saw the tire rack, its unfortunate that its just to unproportonal with the rest of the mower. I stil def dig the rally-baja styling Q's youve done with it. cant wait to see more. If you ever need parts for that HH120 I've got a ton. Thanks. Yeah, they look better on a full size truck/buggy. I'll keep it in mind, thanks. I might use it for something one of these days. 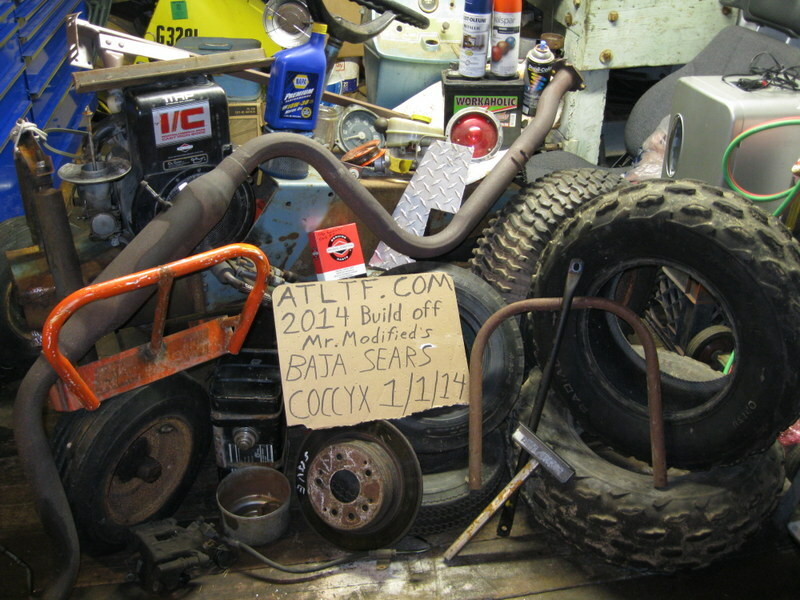 It's supposed to go back on a 67 ski doo Olympic if I ever get it back together. I've been working (slowly) on it for a couple years. You can see the chassis and hood in the background in a few pictures. 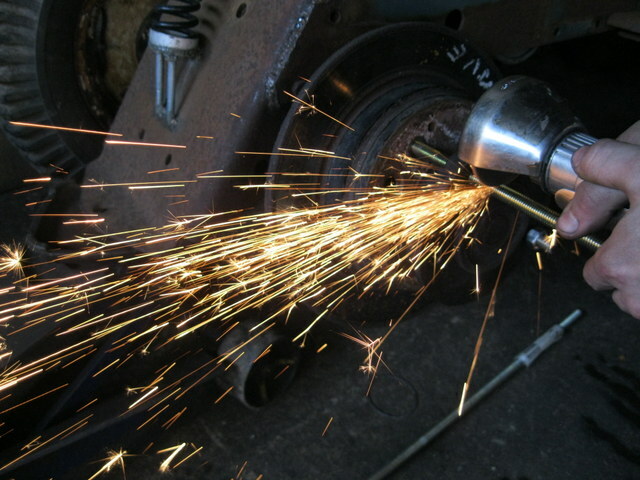 Cutting the new wheel studs to length. 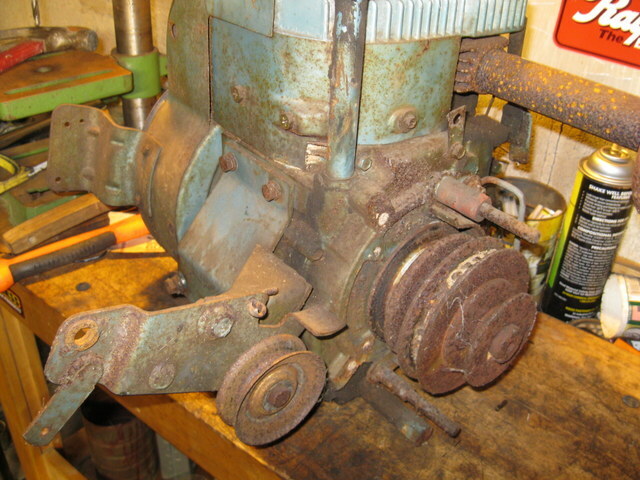 I'll have to adjust the nuts behind the rotor to get the rotor to turn without wobbling later. 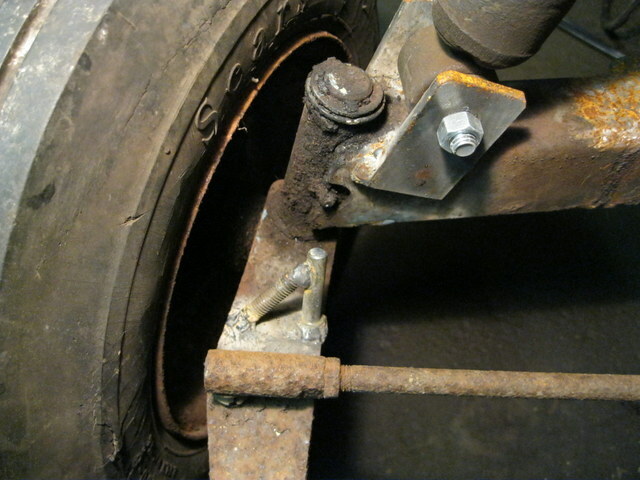 The nuts you can see here behind the hub are welded to the stud. 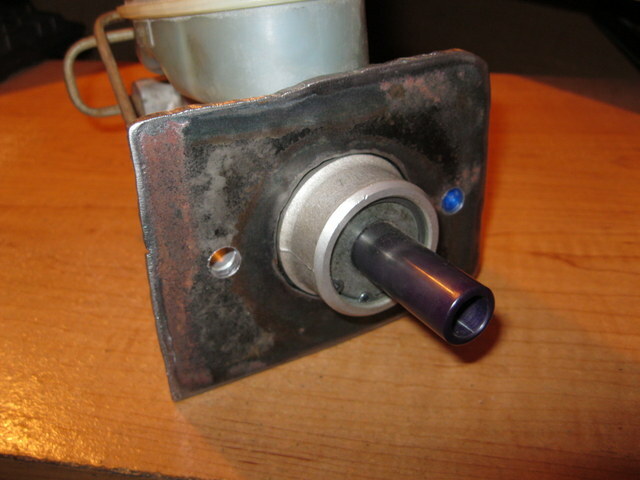 Stud can be locked in place by tightening the nuts against the hub. Overly rugged steering stops. 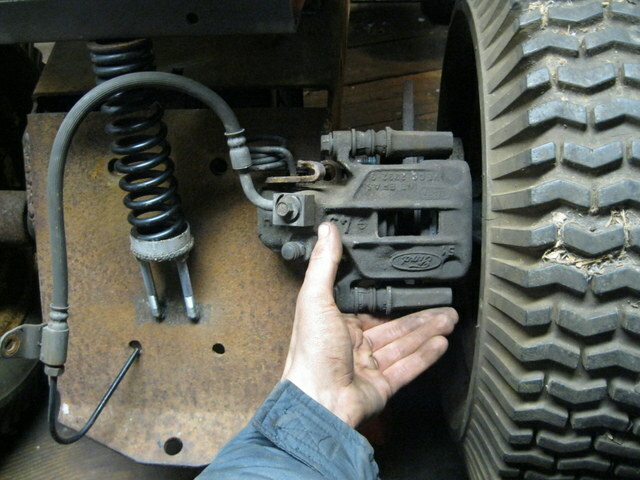 I put them on the steering arm instead of hanging them down off the axle so they don't catch a rock and get bent, even though that would be unlikely that close to the wheel. Note the sears tires. Too bad they're junk, I think the ribbed tread looks neat. Nifty piece of metal with some holes in it makes a cool brake pedal. The rest is 1" square steel. It sits about as high as the clutch pedal on the other side. I was wondering if I should cut the stock clutch pedal up and make it match the brake pedal, but I'll wait and think about it. The gas pedal will be off to the right. I don't know if I'll make my own or use a bicycle handbrake. 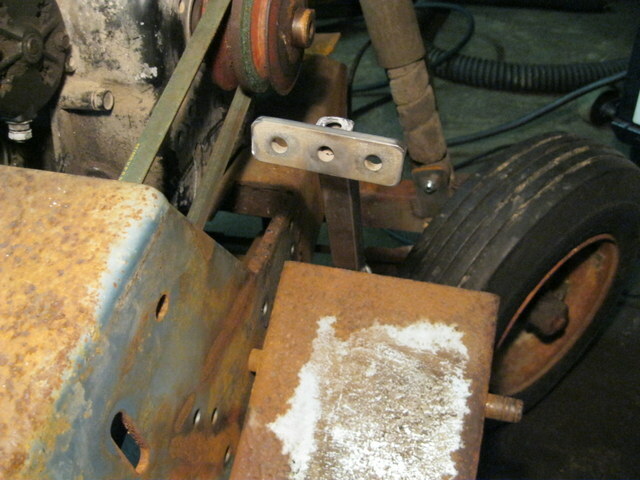 Mocked up the bracket for the master cylinder out of card board. Front wheel seems to clear good at all positions. 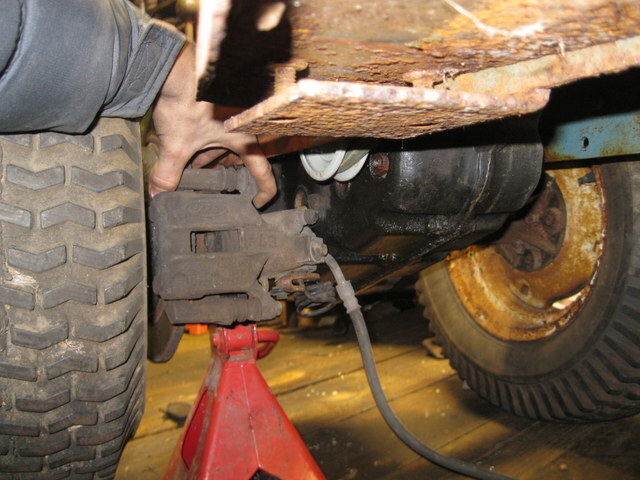 I plan on hooking both brake lines into one before heading back to the caliper. Still didn't decide what caliper I'm going to use. those brakes will be good enough to lock your tires up! hydrolic brakes, sweet. good work. Little things eh? Should be able to get some neat videos with this thing when it's done. That is if I don't get crushed under it or something. Thanks. I worked on the master cylinder bracket a little today and got it pretty much done except for drilling the holes to hold the master cyl. Right now it looks just like the cardboard template. 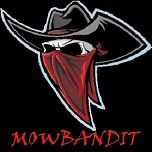 that thing is sweet I love the whole over build idea good work keep it up!! Quicker to just weld on a bolt, that's for sure. Thanks. 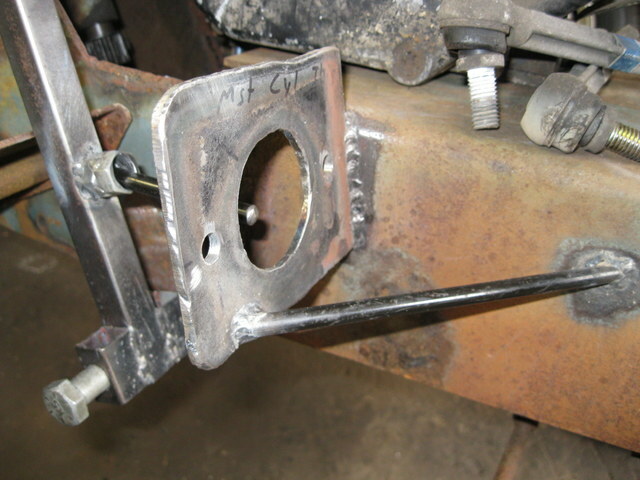 Master cylinder bracket done. Steel from a gas powered air compressor. 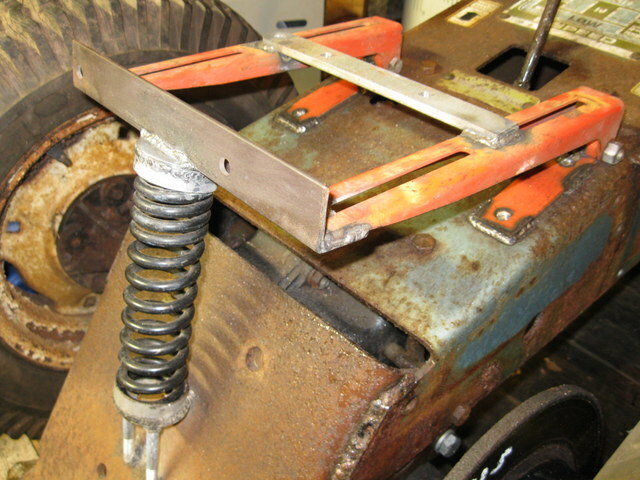 Now I just have to line it up with the brake pedal when I get a chance and weld it to the frame. Also a short linkage rod needs to be made. The blue is a pen cap holding things straight for the picture. Master cylinder bracket and linkage rod to pedal done. 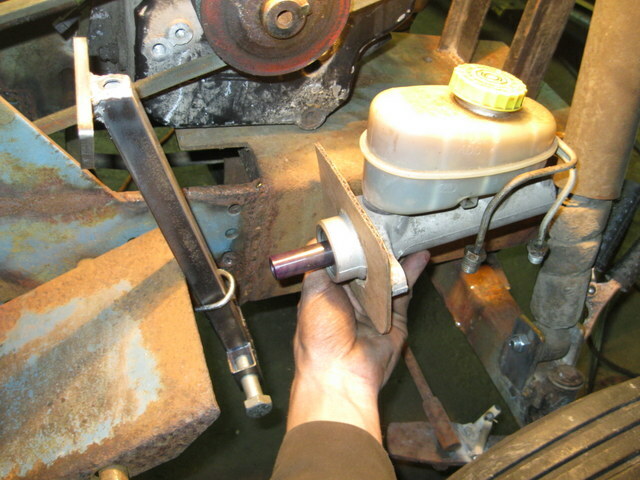 The rod is held in by the master cyl being bolted into place. 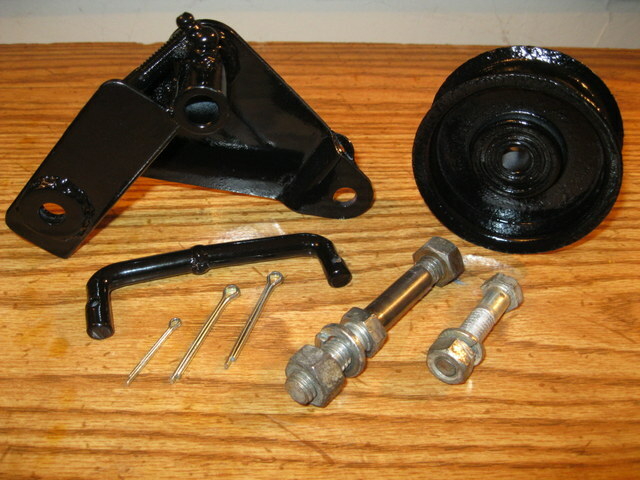 Master cylinder is from 98 Jeep Cherokee. I decided to just use the caliper that I had and bolt it in front of the rotor. I made a bracket out of angle iron. An extention from the transmission skid plate or a extra shield can protect it if nessesary. It's a close fit but I think it will work. 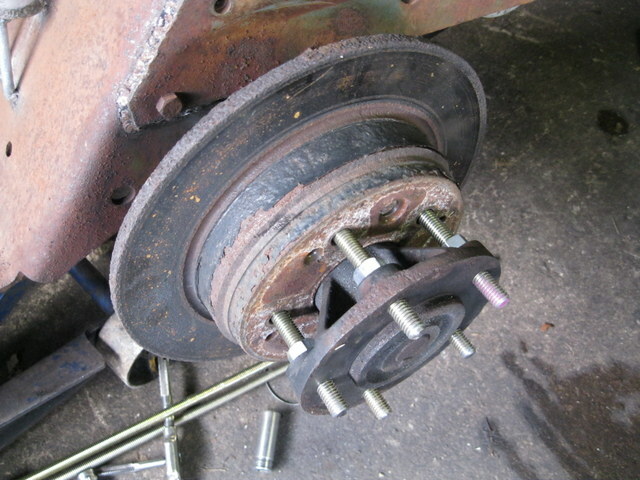 I didn't put the pads in yet, washers space the caliper out to where it needs to be. It's a little early for the hood, but I wanted to see how this would look. With the bumpers on to make the tractor look longer and lower, it might look closer to being the right size. As it is now, it looks a little too high and too wide. Just an idea.